My children love to play and build with blocks and in fact all of those hours of imaginative play also help them learn valuable educational and social skills such as math, science, cooperation and eye-hand coordination. Guidecraft® has taken the standard toy block to new levels with a series of block sets that engage all of their senses including the prestigious Oppenheim award winning Shimmering Water Blocks, Crystal Bead Blocks, Sand Blocks and Rainbow Blocks. My children were immediately drawn to the bold, vivid colors, interesting shapes and even sounds that they discovered when playing with these over-sized blocks from Guidecraft®. Over the past few months, the designs that they have created have been virtually limitless. My four and six year old sons build elaborate cities for their cars, houses for their toy people, obstacle course, roads, towers etc. My daughter as created a doll house for her figurines and miniature pets and even a play table where she had a “tea party” for her stuffed animals. 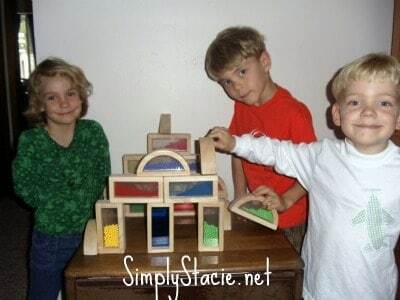 Then there were the times when it didn’t really matter “what” they built but just the fact that they spent time working cooperatively to simply explore the shapes, colors and textures while building quietly. Some time ago, as a gift the kids received the Shimmering Water Blocks ($32) which are a favorite with my children because this set of 8 blocks per package is bursting with “light, color and sound.” This feast for the senses is achieved using hardwood, acrylic, water and metal flakes. 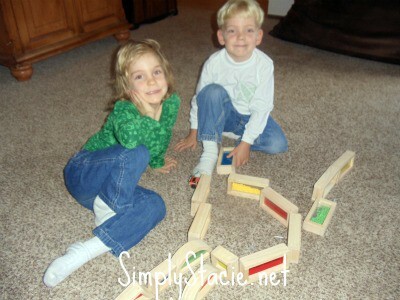 The blocks are incredibly durable and there is always plenty of excitement when my children are playing with these blocks. The set of 8 Crystal Bead Blocks ($32) is an excellent addition to their building blocks sets. The unique blocks can be combined into any number of patterns of shapes and my four year old son loves to shake the beads and listen to the sounds it makes when he knocks over his “tower” of blocks. The award winning Sand Blocks ($32) are another hit because my children were fascinated with the colored sand inside each rectangular or half-moon shaped block. There was definitely lots of shaking and holding of the blocks in different positions while building and the colors are visually appealing too. The Rainbow Blocks ($25) 10 piece set has a hardwood frame that has a durable Plexiglas interior. There are no sharp edges to worry about on this (or any of the other) block sets from Guidecraft® and it is designed to last for many years of building fun. As an educator, I have discovered that the uses in the classroom are unlimited as well. In our math lessons, my six year old son and five year old daughter are learning fractions and we use these blocks in hands on experiments to bring the concept to life. In science class, the blocks become a lesson in the laws of physics and gravity. I am always getting inspired with new ideas and my children are quite happy when the blocks are incorporated into their learning environment. As you are searching for the perfect holiday gift idea, Guidecraft® has an excellent selection of high quality toys for children of all ages. With wood toys that are of the highest quality and various price points, there is sure to be something for virtually every budget. As a mom, I also appreciate the value and durability that I get for all of the products that I have received from Guidecraft®. More importantly, Guidecraft® toys like these blocks sets are consistently their most played with toys so I know that it is getting lots of use and they are learning through play. To purchase any of the Guidecraft toys mentioned in this review or to learn more about all of the educational products available at Guidecraft you are invited to visit their website. Don’t forget to connect with Guidecraft on Facebook too! 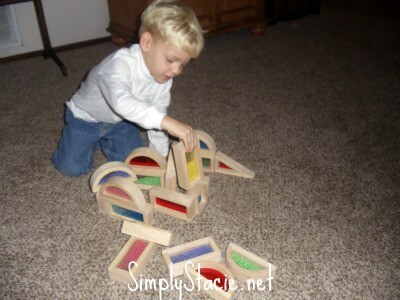 Enter to win Guidecraft Rainbow Blocks, Sand Blocks, & Crystal Bead Blocks at Busy Lil’ Hands!